SKU: AJ-061K-S4CU. Categories: Adrenal Support, Antioxidant, Athletic Boost, Brain Support, Cholesterol, Digestion, Energy Boost, Extracts, Glucose & Lipids, Immune Support, Longevity, Men's Health, Stress Relief, Women's Health. Tags: Adrenal Fatigue, AMPK, AMPK activator, anti-aging, anti-cancer, antioxidant, Anxiety Disorders, Autoimmune Disorders, blood pressure, Brain Fog, cancer, cholesterol, Chronic Fatigue, chronic inflammation, cleanse, col, cortisol balance, depression, detox, diabetic, digestive health, energy, fatty liver disease, flu, gohi, goji berry, headache, heart disease, heart health, immune balance, immune boost, immunity, inflammation, liver disease, liver health, liver support, lower blood sugar, Lycium barbarum, migraine, Mood Disorders, neuroprotection, neuroregeneration, Obesity, rhodiola sacra, stress, stroke, tibertan rhodiola, tumor, vitality, weight loss, wolfberry. What better than to choose the herb most famous for longevity (and to headline its name in our formula) as the leading star for our age-supporting formula? Gynostemma has an almost mythic reputation as a super-healer descended from high peaks in southern China. 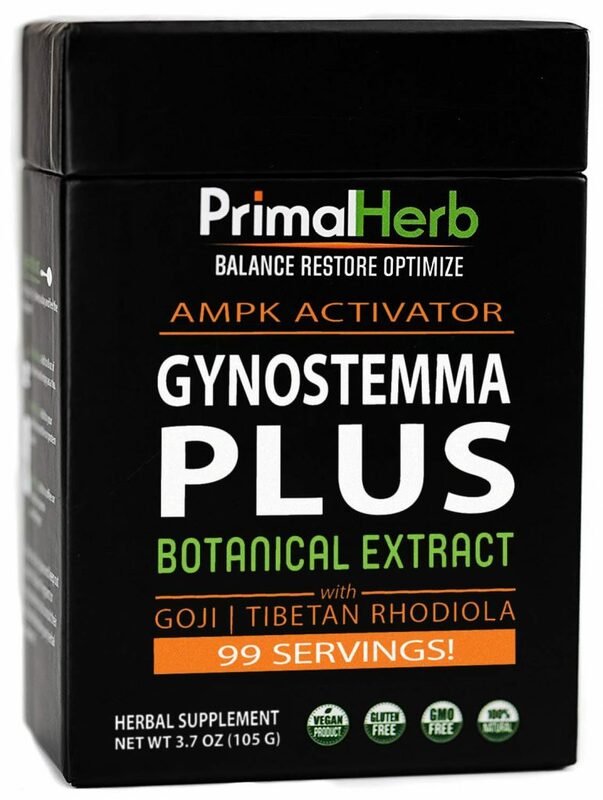 Gynostemma also has way more health benefits than the average herb. Introducing one of our favorite new herbal (as well as nutritious and delicious edible!) ingredients: the goji berry. Goji berry has taken health food stores and markets by storm. There are many different species of rhodiola, and they are always native to high altitude, high latitude areas of the world. However, we chose to select one of the most unique, singular strains for our longevity formula: the holy Tibetan rhodiola, which grows on the slopes of the Himalayas. Experience the herbal zen energy of these holy, Buddhism-inspired lands. AMPK Activator & Adaptogen Support – No Matter How You Mix It! Great product & seller. I like the cute, wooden spoon that comes with it. I mix this with my morning coffee at times, but it’s good on its own. Has a mellow, smooth taste. goes into solution right away and when pouring through a coffee filter in didn’t leave any residue. i add to my coffee every morning. appears to have helped my diabetic circulation and nerve issues. I have been looking for this product in this format which makes it easy to travel with. Product was highly recommended by a friend. We believe in this mantra profoundly. More than just wanting to live longer, the best, purest longevity benefits also mean breathing more LIFE and VIBRANCY into those very same years: by building up health, ALL health, one block at a time. This means finding herbs, nutrients, and foods with the most wellness properties. The best life and longevity isn’t possible through the ordinary. That’s why we’ve carefully hand-picked only the most unique, extraordinary herbs to go into this formula perfect for aging, and all the most common health concerns that go with this necessary rite of passage. Best of all, this exotic Asian berry can now be found practically anywhere. But there’s no better place to find it than alongside other longevity-promoting ingredients. This powerful herb was fabled to confer an incredibly long life to those who partook of it. Some claims over the centuries have been tremendous, though its discovery and traditional use have a strong basis for very real longevity possibilities. For one, cultures living near its native habitat often reached ages older than 100. This only applied to native cultures in southern China (where the herb is from) that drank a tea of the herb every day. The high secluded regions of the Himalayan mountains have always held some of the best-guarded secrets to inner peace, healing, bountiful health, and yes, longevity. Tibetan Rhodiola, an offshoot of the very same adaptogen Rhodiola seen in the health supplement sections, just so happens to embody all those things. With the nickname “Plateau Ginseng,” this herb is not to be underestimated. We believe purity and sustainability are also a pivotal part of sourcing ingredients that best prime us for passage into old age. Only the highest quality ensures the highest potential for optimal longevity. This is why we only (and carefully) select ingredients that are sustainably and responsibly sourced, harvested, or grown in their native regions around the world. Instead of seeking out each of these longevity-enhancing ingredients on their very own, why not experience their magic all together? Save money on several different supplements, and instead find all of them in one in this pure and sustainably harvested supplement blend. 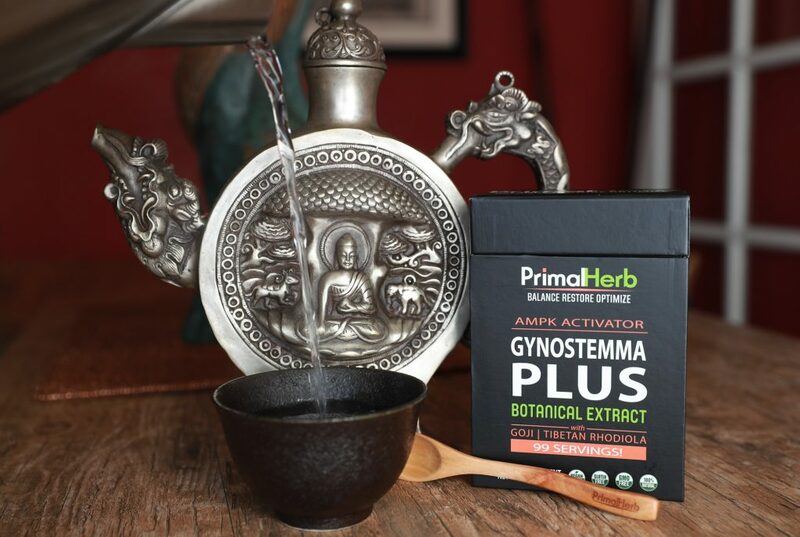 With Gynostemma PLUS, you’ll taste the difference—and the synergy. In true honor of Ayurvedic practices, these three ingredients—popular healing herbs of the Ayurveda tradition itself—synergistically enhance and complement each other’s effects better combined than when taken alone. 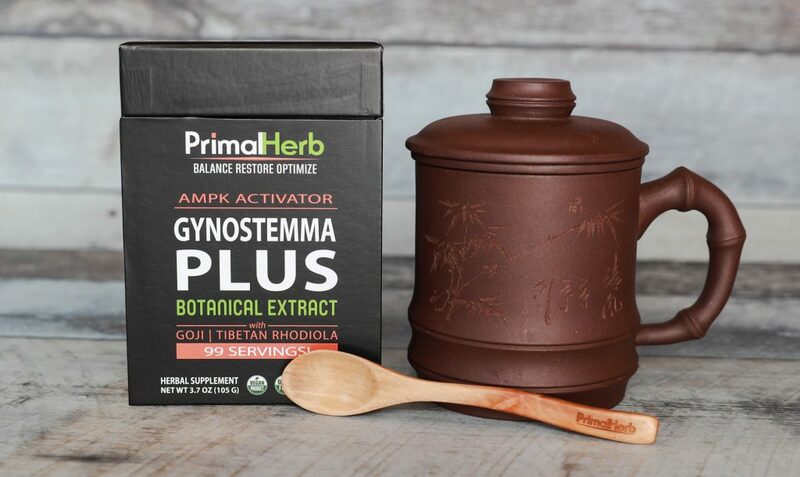 With Gynostemma, Goji Berry, and Tibetan Rhodiola together in Gynostemma PLUS, you have three powerhouse adaptogen botanicals all in one blend for better energy, vitality, and longevity. * That is a guaranteed boost to health, no matter how you mix it! Gynostemma can be taken day or night – with or without food, so enjoy! I love this product, and PrimalHerb comes through on quality and ease of ordering. I am feeling better taking this since having issues with weakness and respiratory issues. It feels like my circulation has improved and my heart is at ease. I have my to take it also for blood pressure related issues.